Lent 5 Sermon: "Greatness and Glory in the Cross"
For the disciples it’s a journey that begins in fear, but ends in joy and boldness. For now, all they can think about is the destination - Jerusalem. “Why go there, Jesus? Everyone wants you dead. Jerusalem is nothing but trouble.” They’re so concerned about glory, greatness, and God’s kingdom that they misunderstand that God’s glory, greatness, and kingdom are found in the death of His Son. Lent is a journey. Not an aimless wandering. Not an evening walk down the beach. The road goes ever on to Good Friday. Jesus sets his face. There’s no delay. No time for site-seeing or recreation. Jesus must go. Jesus journeyed in life to serve you. Jesus journeyed to death to serve you. Lent is Jesus’ journey for you. They were on the road going up to Jerusalem, St. Mark records Jesus’ death and resurrection predictions like signposts along the highway. Three times in Mark’s Gospel –before Jesus’ transfiguration, after his transfiguration, and here in Mark 10, before entering Jerusalem – Jesus predicts his death and resurrection. And each time Jesus reveals more about his brutal crucifixion which awaits him. Behold, we are going up to Jerusalem, and the Son of Man will be betrayed to the chief priests and to the scribes; and they will condemn Him to death and deliver Him to the Gentiles; and they will mock Him, and scourge Him, and spit on Him, and kill Him. And the third day He will rise again. Lent is a journey. But the disciples weren’t alone on the road. Jesus was walking ahead of them. before us, to carry our burdens of fear, guilt, and death to the cross. You are not alone either. Not in Lent. And not in your fear, sorrow, or death. sinful though you are. His dying and rising changes you too. to Jesus. Grant us to sit, one at your right hand and one at your left, in your glory. kingdom will be established in Jerusalem. our fingers at James and John. “What’s with these guys? How thick can they be? what they wanted to first. well. Our problem – like James and John – goes deeper. We want greatness. Glory. God’s kingdom. But we want it all on our own terms, not God’s. My will be done. My kingdom come. Our self-serving sinful nature wants nothing to do with the cross but everything to do with glory and looking out for number one. “What I get out of this,” we ask – at work, at home, even at church. “What’s in it for me?” Such is the self-centeredness of our sin. “Are you able to drink the cup that I drink, or to be baptized with the baptism with which I am baptized,” Jesus asks them. “We are,”. They still have no idea what they were saying or what Jesus was talking about. Jesus’ cup and baptism are his death. Jesus drinks the cup of God’s wrath and the poison of our sin, down to the last drop. Jesus’ cross is a baptism of judgment. Jesus is drowned in the flood of God’s wrath. Jesus is immersed in our sin and death. The disciples will share in the cup and baptism of Jesus’ suffering and death. All but one will be martyred for the faith. Indeed, all who are called Christians share in the cup and baptism of Jesus’ suffering and death. For some, it comes in the form of persecution and death. 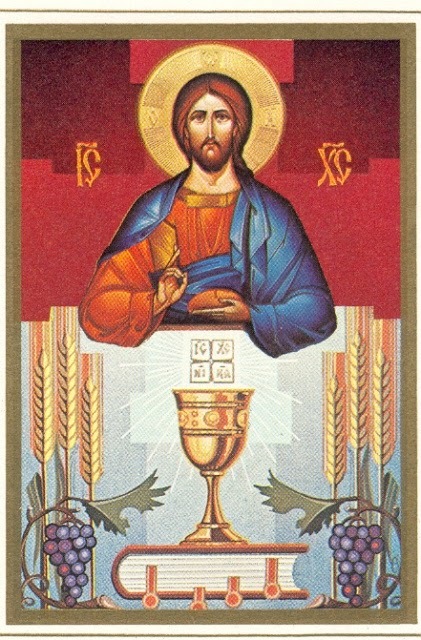 wrath so that we may drink His cup of forgiveness. Jesus drank the curse down to the dregs so that you might drink the cup of blessing. Jesus hides his crucified and risen flesh in the greatness and glory of bread and wine. God’s kingdom comes to you in Jesus’ body and blood. So it is in your baptism. Jesus is baptized into our death so in Baptism you are united with Jesus’ death and resurrection. We have no idea who will sit at Jesus’ right and left in the heavenly kingdom. That’s not for us to know. But we do know who was granted to sit on Jesus’ right and left when He came into His glory on earth. Not James and John. Not us. But two nameless thieves. One mocked Him to His death. But the other spoke truthfully. This man has done nothing wrong. the cup and baptism for you. and baptism given to you in the Supper and the Font. It’s not about getting a good word in with Jesus, but hearing God’s good Word to us in Jesus. It’s not about prestige and who gets the honored seat, but about trust in the One took the lowest seat of the grave to seat you in the heavenly places. For whoever would be great among you must be your servant, and whoever would be first among you must be slave of all. The highest form of greatness, then, isn’t found in man’s glory or greatness, but in being a servant, in sacrificial love. That’s how the kingdom of God looks in this world. That’s how your life in Christ looks. Humble, self-giving servants of the Servant of all, who endured the baptism of His cross and drank the cup of God’s wrath in order to save you, me and the world. Jesus came as a suffering Servant to serve. And you, His baptized believers, share His cup and serve. Take up our cross. Lay down our lives. That’s greatness in His kingdom. Not power, but sacrifice. Jesus lives to serve you. Jesus dies to serve you. Jesus erased our curse by becoming the curse for us. Jesus triumphed over death by dying in our place. Jesus became the last one to make us the first in line. Jesus gave his life, to give you life. This is where Jesus leads us during our Lenten journey, just as he did the disciples. To Jerusalem for you. To the cross for you. Jesus journeyed in life to serve you. Jesus journeyed to death to serve you. Lent leads us to Palm Sunday and shouts of Hosanna! Blessed is he who comes in the Name of the Lord. Hosanna in the Highest. Lent leads us to Holy Thursday: This cup that is poured out for you is the new testament in my blood which is shed for you for the forgiveness of your sins. Lent leads us to Jesus’ hour of glory - Good Friday. It is finished. Fulfilled. Accomplished. For you. Lent leads us to Easter: to unrestrained rejoicing. Christ is risen for you. That’s the destination. But first the journey. I’d like to take a brief moment to write something positive about the entertainment industry. I know what you’re thinking, can anything good come from Hollywood? Believe me; I know. I live in Southern California. We know crazy (Britney Spears, Miley Cyrus, and the beat goes on). Hardly a week goes by without some kind of celebrity shenanigans (serious or just plain silly) making headline news. After all, we’re still talking about Harrison Ford’s Kessel Run into a local golf course. But once in a while the entertainment industry surprises you and gets it right. Perhaps it’s even more shocking when the “it” happens to be Christianity. 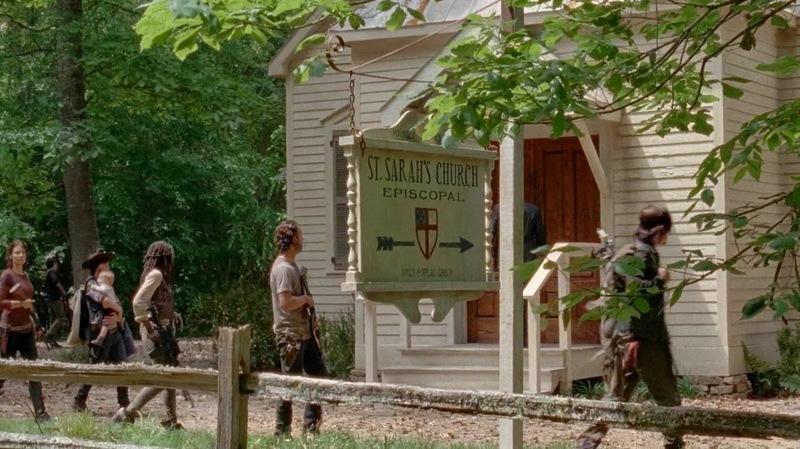 I mentioned in a previous article (Sundays are for the Walking Dead) that I enjoy watching The Walking Dead because it is a good story, and frequently draws on Christian themes or influences. For instance, in a recent episode (March 8th, 2015) Away in A Manger was playing in the background during a dinner party in Alexandria. But more seriously, this is a survival story. And one of the things that helps people survive in this world of guilt, fear, and death is religion. Now, I would argue that the most convincing, confident, and comforting answer to humanity’s problems of guilt, fear, and death is Jesus’ death and resurrection. Jesus’ death and resurrection is a well-told story, beautiful in its meaning, sublime in its consolation, and yet it is also true, verifiable, and veracious. Jesus died in a particular place at a particular time with reliable eyewitnesses that testify to his dying and rising. He was crucified under Pontius Pilate. Jesus’ death and resurrection is history, but the event does not cease to be a good story. Jesus did not die and rise in a post-apocalyptic television show. But can his factual death and resurrection be found in such fictional places? I think so. We shouldn’t be surprised to find Christian themes in a show that deals largely with fear, guilt, and death in every episode. In fact I think the opposite is true; I would be surprised if shows like The Walking Dead contained no themes or echoes of Christianity at all. But in fact, many shows and movies like The Walking Dead do. 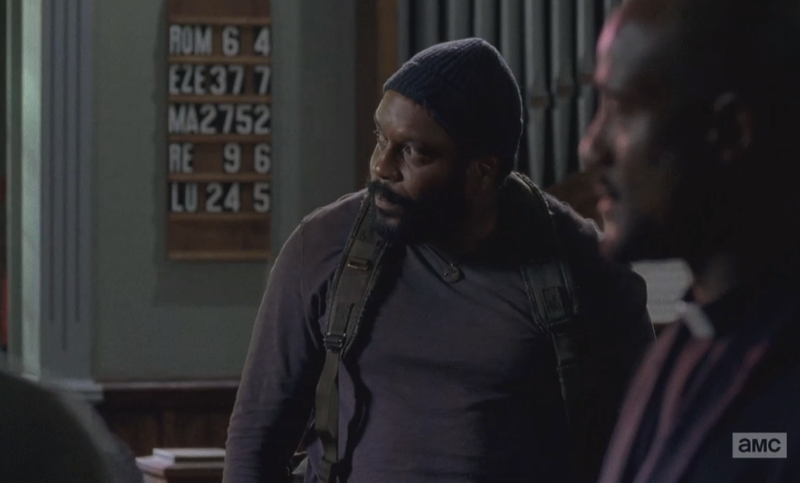 Earlier in the season, the band of survivors spent several episodes in an abandoned Episcopalian church. On the interior wall of the nave, just to the right of the chancel was a hymn board. Granted, a bit of ignorance is revealed in that the hymn board was used for Bible verses instead of actual hymns. And yet on the other hand, the writers revealed some intriguing biblical proof-texting skills. For upon this hymn board in the wilds of walker infested Georgia, were posted the following bible verses. This was no coincidence. Whomever it was that wrote these episodes, took time to think about what these verses meant and why they should be included on set. Someone on the writing staff knew that viewers (I can’t be the only one) would take the time to look these verses up and reflect upon them. Certainly, context can’t always be known in one verse. But read the verses and their context. It’s all about dying and rising. I find it fascinating, and rather profound, that in a fictional show about death and survival, someone was thoughtful enough to find and display several key Scripture passages which, in reality, show how one can indeed survive death. The answer to the tragedy in the world that is depicted in The Walking Dead is not found in the zombies rising from the dead, but in Christ’s death and resurrection. The answer to the fundamental problem that faces all of us in the real world - guilt, fear, and death - is found in Christ’s dying and rising for you, and in these words. Lent 4 Sermon: "Divine Love"
The players line up. Snap. Kick. The football splits the uprights. It’s good. 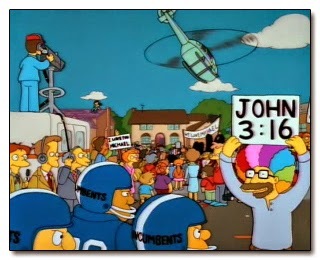 And then the camera zooms in on a celebrating fan hoisting a neon construction paper sign, and on it, only a name and a few numbers…John 3:16. 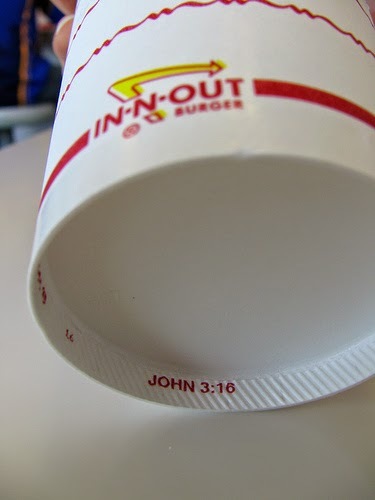 We’ve probably all seen some variation of this: sky writing, bottom of the In N Out cup, or at a sports game. Next to Psalm 23, John 3:16 is probably one of the most well-known Bible verses. And for good reason. Like the season of Lent, Jesus’ words point our eyes and our ears to Jesus Crucified for you. The closer we get to Holy Week, to Good Friday, the more Jesus points our eyes and ears to his death for you. John 3:16 is the Gospel in a nut-shell. It’s as comforting as it is memorable. You can carry it with you to your neighbor or anyone who asks for a reason for the hope that is within you. But what does this verse mean? True, God’s love for us is unfathomable. We could travel across time and space in a police box or a DeLorean and never reach the end or limit of God’s love. For as high as the heavens, so great is his steadfast love towards you (Psalm 103:11). It’s true, God loves you in Christ Crucified to infinity and beyond. But there’s more to this verse than the magnitude of his love. And speaking of love, we use the word love for anything: I love Tillamook Cheese. I love Oregon microbrews. I love rain. I love lamp. Misuse a word long enough and we lose the meaning of the word. Problem is, we think of love primarily with our emotions. Love is how we feel about something or someone. Or rather, how someone or something makes us feel. Do you see the problem? Inevitably, our love leads us right back to our greatest love of all…ourselves. We take God’s gift of love and twist it into an idol. Love is all about my contentment. My happiness. Or whatever makes me feel good. And haven’t we all thought that? Repent. For this is selfish, self-love of the highest order. For who of use can say that our love is long suffering, patient, or kind? That we do not envy others or boast in ourselves? That we’re not rude, arrogant in constantly insisting on our own way? Not a one of us. For in truth, we delight in doing wrong. In sin, that’s what we love: the darkness. For apart from Christ all our loves - the people, places, and gifts in God’s creation that are good and lovely – are idols. But while our love looks inward, God’s love looks outward. Where our love desires only our own interests and well-being, God’s love desires and seeks the well-being of others. Though our love is selfish, God’s love is selfless, self-giving, self-sacrificing – for you. Jesus isn’t sitting in heaven writing schmaltzy Hallmark cards or country ballads. God’s love isn’t about warm fuzzies or Jesus-is-my-girlfriend songs. In John 3, Jesus is teaching Nicodemus, and us, how God loves the world. Now…try reading John 3:16 again like this: God loved the world in this way, that He gave His only begotten Son, that whoever believes in Him should not perish but have everlasting life. John 3:16 isn’t about emotional or self-serving love, but divine love. God loves the world in this way: the Father gave his Son into death as a ransom for rebels who hated him and killed him and only love themselves. God’s love is gift-love. Jesus’ death on the cross is how God loves the world. Jesus dying for you is how he loves you and makes you his again. As great as our love for ourselves is, Jesus’ love for you on the cross is greater. Where our love is all about taking for ourselves, God’s love for you is all about giving himself to save you. Love is what God does for you. Love is who he is. The Father gives. “The Father gives all he is and has to the Son. The Son gives Himself back to the Father, and gives Himself to the world, and for the world to the Father, and thus gives the world (in Himself) back to the Father too” (Lewis, The Four Loves, p. 7). The Father does not withhold from us His Son, His only Son. 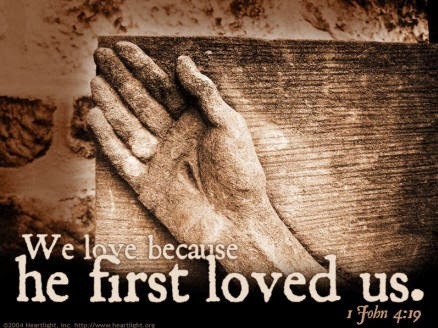 Jesus stretches out his arms on the cross for you to show you how and how much he loves you. He loves you to death. For God did not send his Son into the world to condemn the world, but in order that the world might be saved through him. Jesus’s death atones for all of our love – the good, the bad, the ugly. Jesus covers our selfish love with his sacrificial love. For God’s love in Christ Crucified is patient and kind. God’s Son is not arrogant or rude; He does not insist on his own way. God’s love for you in Christ Crucified never fails. This is why Christians often make the sign of the cross. Or why we display a crucifix or cross in our church and homes. The cross tells us who Jesus is and what he does. 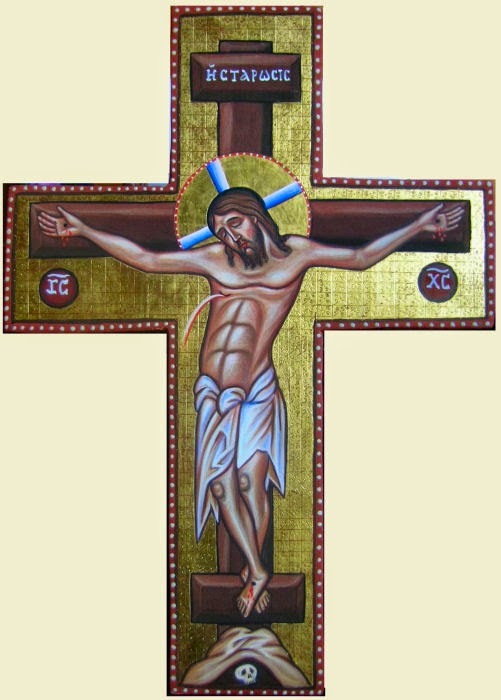 The crucifix shows us the clearest picture of God’s love. It’s a sermon all by itself. But Jesus’ love doesn’t stop at the cross. God continues to love you in this way: You are baptized. God drenches you in his saving love by water and word. God proclaims his unconditional love for you in absolution: You are forgiven all your sins. God loves you in this way: He pours the blood of Christ into your mouths so that you will not perish but have eternal life. In the previous segment, we concluded with the imagination and its use in declaring and defending the Christian faith. As we will see in Tolkien’s writings, it is his adept ability at combining imagination with Sub-Creation to give his fictional world of Middle-Earth that ‘inner consistence of reality’ reality’ which points to the truth of the Gospel, the greatest story ever told. But before we can learn the benefit of and positive use of the imagination in Christian apologetics we must first ask a very important question. What do we mean by imagination? I've always appreciated Tolkien’s definition of imagination in his essay On Fairy Stories. The mental power of image-making is one thing, or aspect; and it should appropriately be called Imagination. The perception of the image, the grasp of its implications, and the control, which are necessary to a successful expression, may vary in vividness and strength: but this is a difference of degree in Imagination, not a difference in kind. The achievement of the expression, which gives (or seems to give) the ‘inner consistency of reality’, is indeed another thing, or aspect, needing another name: Art, the operative link between Imagination and the final result, Sub-Creation. According to Tolkien, we work with the tools and resources that are found in the Primary World. The writer uses words and images. The musician uses instruments and notation. The Sculptor uses clay or another medium. The painter uses brushes and various paints. And so on. As a Sub-Creator, Tolkien was able to capture and captivate both the imagination and art within the particular genre he is most noted for, that of fantasy. This is due, at least in part, to the fact that Tolkien was a philologist who lived up to the title. He aptly fit his own description of a Sub-Creator. “Fantasy is made out of the Primary World, but a good craftsman loves his material, and has a knowledge and feeling for clay, stone and wood which only the art of making can give.” So, then, Sub-Creation, captures and releases both the imagination and art. For Tolkien, image and imagination were two essential ingredients in a well-told fairy story, or fantasy, genres he uses interchangeably at times in his writing. The process for Tolkien went like this: Imagination leads to Art; Art leads to Sub-Creation; Sub-Creation reflect or points to the Primary World, or Primary Art. It has, that ‘inner consistence of reality’. 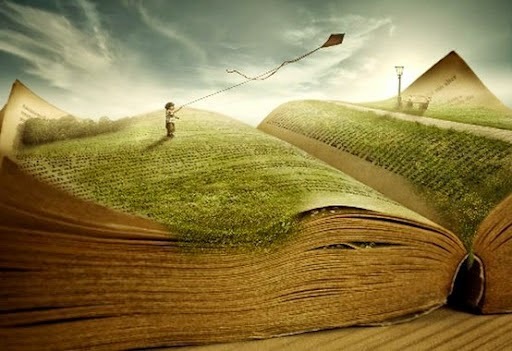 Imagination, then, forms the images that later become words and develop into a full-fledged story. And it is within the context of the story telling where the imagination can point us toward the Christian faith. 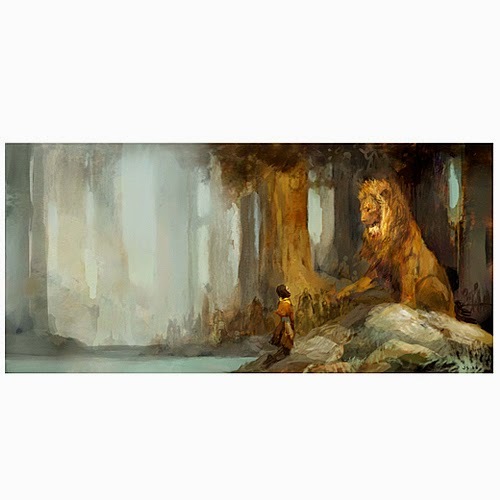 One of the primary reasons Lewis’s and Tolkien’s writing was, and continues to be, so magnetic was their sublime ability for making enchanting, magical, and mythical (in the best sense of the word) secondary worlds reflect the Primary World. They were able to write fantasy which accurately and evocatively depicted reality. This was intentional. Tolkien wanted his stories to be told in a land and geography where ‘miles are miles’. Good fantasy, Tolkien says, is based upon reality and points back to it. For creative Fantasy is founded upon the hard recognition that things are so in the world as it appears under the sun; on a recognition of fact, but not a slavery to it…If men really could not distinguish between frogs and men, fairy-stories about frog-kings would not have arisen. In a similar vein, Lewis repeatedly said that fantasy does not teach us to escape reality, but rather it sheds light upon reality. We see the world better having read good literature. Storytelling awakens us to the beauty of ordinary life around us, and opens our eyes to the enchantment of the everyday world we live in. Rather than dull the senses, it accentuates them. It would be much truer to say that fairy land arouses a longing for he knows not what. It stirs and troubles him (to his life-long enrichment) with the dim sense of something beyond his reach, and far from dulling or emptying the actual world, gives it a new dimension of depth. He does not despise real woods because he has read of enchanted woods: the reading makes all real woods a little enchanted. 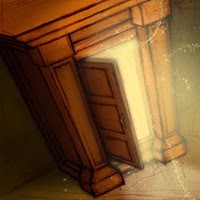 In the final segment we’ll take all the pieces we’ve unpackaged and put them together in our ongoing discussion of imagination, art, and sub-creation in service of apologetics. J.R.R. Tolkien, On Fairy Stories, in Tree and Leaf. London: Harper Collins Publishers, 2001. p. 47. J.R.R. Tolkien, On Fairy Stories, in Tree and Leaf. London: Harper Collins Publishers, 2001. p.61. J.R.R. Tolkien, On Fairy Stories, in Tree and Leaf. London: Harper Collins Publishers, 2001. p.55. C.S. Lewis, On Three Ways of Writing for Children, in Of Other Worlds: Essays and Stories. San Diego: Harcourt, Inc. p. 29-31. Lenten Midweek Sermon: "The Cross in Holy Baptism"
Once again Redeemer Lutheran has been blessed to participate in a Lenten pulpit exchange with a number of local LCMS congregations. The focus is always on the Scriptures and Small Catechism. This year's theme is the preaching of the cross in the catechism. 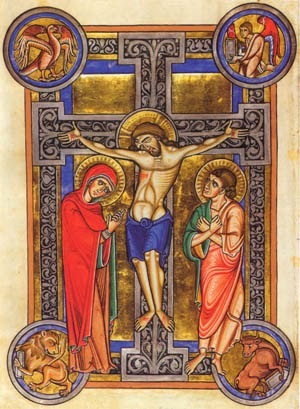 I was given the topic of "The Cross in Holy Baptism". A blessed Lent to you all. Water kills. Water gives life. We see reflections of this in some of our most beloved books and films: Dorothy hurls water on the Wicked Witch and as she melts, Scarecrow is saved from the fire. Andy Dufresne, in The Shawshank Redemption, crawls through the sewer to escape from prison and stands in the cleansing rain. 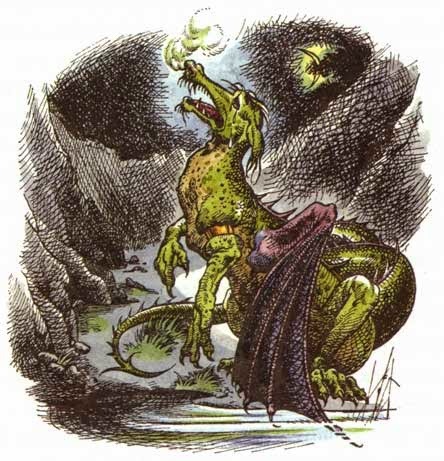 Eustace Scrubb, in Lewis’s Dawn Treader, is overcome by his selfish desires and turned into a dragon but later un-dragoned by Aslan in a pool of water. Water kills. Water gives life. And not just in stories, but in reality. The flood destroyed everything on dry land in whose nostrils was the breath of life, everything except Noah and his family. Eight souls in all, saved through water. God drowned hard-hearted Pharaoh and all his host in the Red Sea, yet He led His people Israel through the water on dry ground; they were baptized in the sea. The prophet Jonah was thrown into the sea; the waters of the deep closed around him; weeds encircled his head; he was buried in a liquid grave. And yet the Lord raised him from the watery pit. And in this, you have something in common with Noah, Moses, and Jonah. The Lord fixes his Word - which also kills and makes alive - to water in order to bury you in his death bless you in his resurrection. The same Lord who opened the heavens and the wells of the deep, opens the font, drowns your sin, and saves you in a flood of forgiveness. Like Andy Dufresne, you are cleansed from the filth of your sin in Jesus’ redemption. The same Lord who led the people Israel through the Red Sea on dry ground, leads you through Baptismal waters while Satan and all his hosts are swept away. Jesus hurls Word and water upon us. Ding-dong, the wicked serpent is dead, and you’re saved from the flames. The same Lord who appointed a great fish to swallow up Jonah was swallowed up by death, once for all. 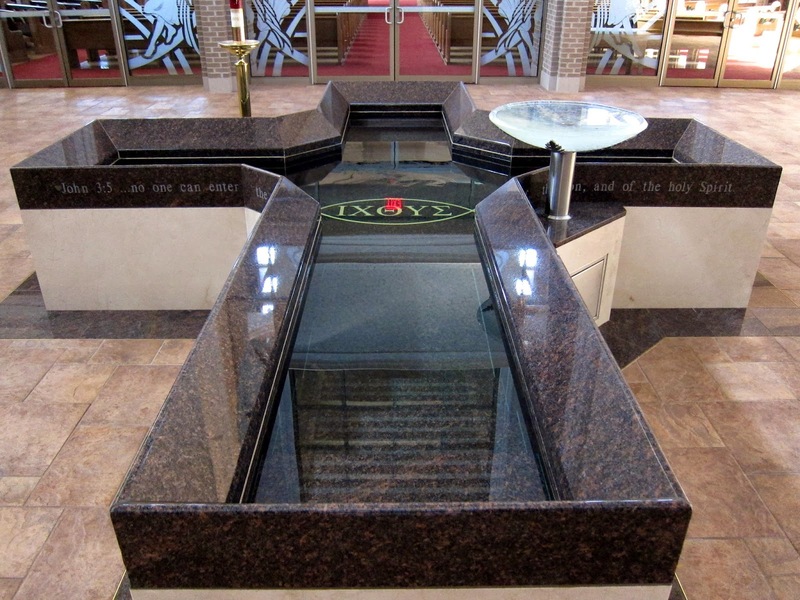 Like Jonah and the fish, the grave will spit you out through your Baptism into Jesus’ death and resurrection. Like Eustace, Jesus un-dragons you in Baptism. Noah was not alone in the ark. Moses and Israel were not alone at the Red Sea or in the wilderness. Jonah was not alone, even in the belly of the great fish. And you are not alone in the font. Jesus is with you in water and Word. Your Baptism is soaked with Christ’s promises. You are saturated in Jesus’ cleansing sacrifice for sin. In Holy Baptism you die and rise with Jesus because Jesus died and rose for you. Jesus’ cross is in your Baptism. In Holy Baptism you go where Jesus goes. Jesus dies for you; you die with Jesus. Jesus rises for you; you rise with Jesus...in your Baptism, and in the resurrection of the dead. This is remarkable, miraculous! Baptism gives you Jesus. Lent and Easter also give us Jesus’ dying and Jesus’ rising. In Baptism Jesus’ gives us his Lent and Easter. Jesus’ bitter suffering and death; Jesus’ agony and bloody sweat; Jesus’ cross and passion - it’s all yours in Baptism. Jesus’ victory over the grave; Jesus’ glorious resurrection and ascension - all yours in Baptism. 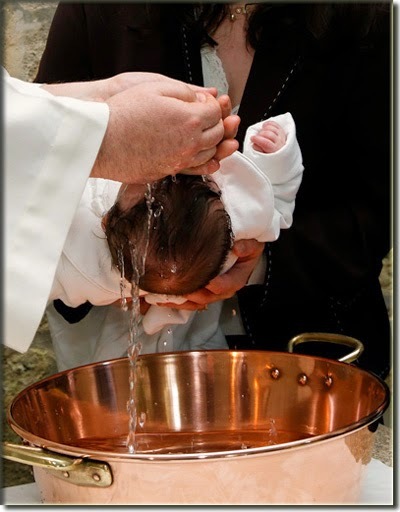 Your Baptism - and every Baptism - is a little Lent and Easter, poured into the font and poured over us. And so, every day is a little Lent and Easter. Let us never say, “I was baptized” but rather, “I am baptized into Christ.” Baptism is always present tense. Daily we die to sin. Daily we rise to new life in Christ. What does this mean? To die to sin means to confess it. Confess that we who have died to sin still live in it. And not only that, but we love it. We are quick to slake our sinful thirsts above our neighbors’ needs and against God’s will. Confess and repent that our heart is an arid, loveless wasteland. Confess and repent that our lips gush with praise for ourselves while our prayer, praise, and thanks to God is dusty bone-dry. Confess and repent that our mouths are parched from our constant slander and gossip and hatred for others. Confess and repent that our love for our neighbor is a drought of mercy while our love for ourselves is a reservoir, full of greed and self-serving. It is good, then, that Lent and Easter bring us Jesus’ death and resurrection. Water kills. Water makes alive. Baptism comes to irrigate the desert of our hearts. Baptism brings Jesus’ death and resurrection to you. You are washed by his blood. Cleansed by his sacrifice. Buried in his tomb. Risen with Christ. Consider yourselves dead to sin and alive to God in Christ Jesus. Therefore, do not present your members as instruments of unrighteousness to sin, but present yourselves to God as being alive from the dead, and your members as instruments of righteousness to God. For sin shall not have dominion over you, for you are not under law but under grace. What does this mean? Live in your Baptism. Remember who you are in Christ, a new creation. You belong to Jesus. And Jesus’ death and resurrection belong to you. When you’re sharing the Gospel with your co-workers, friends, neighbors, and family – or even those you do not know, like Jonah did...remember, you have died and risen with Christ in Baptism. Your mouth is now an instrument of grace. When you’re lending a helping hand for your neighbor…remember, you have died and risen with Christ in Baptism. Your hands are now instruments of mercy. When death stares you in the face and causes you despair…remember, you’ve already died and risen with Christ in Baptism. Death no longer has dominion over Jesus…or you. When all you see is a world, like Noah did, full of wickedness…remember, you have died and risen with Christ in Baptism. In this world you will have trouble, but fear not, Christ has overcome the world and gives you his victory in your Baptism. And when Satan waves your sin in your face like a dirty diaper, remember…you have died and risen with Christ in Baptism. All your sins belong to Jesus now. Take comfort in God’s promise: I am baptized into Christ. And if I am baptized, I am dead to sin and alive to God in Christ Jesus. Jesus is your Greater Noah, who keeps you safe in the holy ark of the Christian Church. Jesus suffered the divine deluge of judgment in your place. Jesus is your Greater Moses, who leads you through the water into the Promised Land; Jesus conquered the Pharaoh of hell on the cross for you. Jesus is your Greater Jonah, whose head was encircled in thorns, who descended into the pit, and spent three days in the belly of the earth to raise you from the dead. Death could not hold Jesus; and neither will it hold you. And what does such baptizing with water indicate? It indicates that the Old Adam in us should by daily contrition and repentance be drowned and die with all sins and evil desires, and that a new man should daily emerge and arise to live before God in righteousness and purity forever. Lent 3 Sermon: "Jesus is the Temple"
Lent 2 Sermon: "The God Who Bears"